The beautiful churches of the 18th and 19th century along the Kama River are a testament to the wealth of the area's salt mines. The Ural Mountains, which divide Russia into its European and Asian parts, have long been one of the most significant sources of the country's mineral wealth. In the 17th and 18th centuries, the discovery of iron, copper, salt and other valuable mineral deposits transformed remote mining outposts into thriving towns such as Ekaterinburg. Before the expansion of Russia's rail network into the Urals during the second half of the 19th century, one of the major challenges was delivering this bounty to Russia's major population centers. A partial solution to this transportation problem was provided by the region's ample network of rivers. 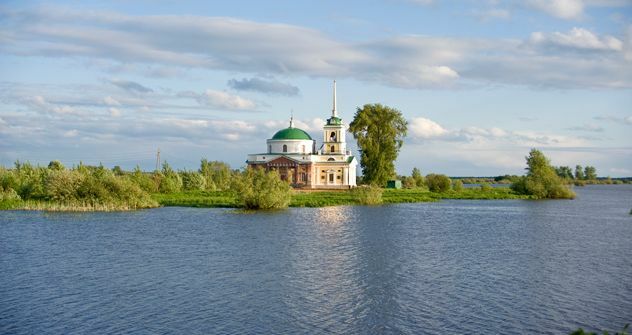 The most important river on the European side of the Urals is the Kama, which flows through the vast Perm Territory and enters the Volga River south of Kazan, the capital of Tatarstan. Major mineral deposits—particularly potash – are still being processed along the left bank of the Kama at towns such as Berezniki and Solikamsk. Nearby on the right bank of the Kama is the town of Usolye, whose name is also derived from the word for salt. Situated 180 km (112 miles) north of the regional capital of Perm in an area rich in salt springs, Usolye was established in 1606 by Nikita Grigorevich Stroganov as the center of the Stroganov family’s rapidly expanding salt production empire on the Kama River. The Stroganovs had already become Russia’s leading producer of salt through their operations centered at the northern town of Solvychegodsk. The settlement of Usolye was intended to consolidate their ability to tap the resources of recently opened territories in the Urals. As in Solikamsk, the growing wealth of Usolye in the 18th century was reflected in the construction of churches such as the imposing Cathedral of the Transfiguration, built in 1727-33 with funds provided by Baron Sergei Stroganov (Peter the Great elevated the Stroganovs to noble status for their largesse during the Great Northern War). Like other Stroganov endowed churches, the Transfiguration Cathedral displays profuse ornamentation. In 1820, it was expanded with the addition of an unusual semi-rotunda on the west end. Complementing the cathedral is a tall bell tower built in 1730 and reinforced in 1830. The Transfiguration Cathedral and its bell tower formed the nucleus around which the town grew; commercial buildings, warehouses, and salt refineries were constructed in the area. The most imposing structures in the early 19th century were mansions built not only by the Stroganovs, but also by other major holders of salt works such as the Golitsyns and Prince Sergei Abamalek-Lazarev, who purchased the local Stroganov holdings in the 1830s. The wealth of Usolye depended on the Kama River, but the Kama proved a mixed blessing. Periodic spring flooding was replaced by a far more radical change in the Soviet era, when massive power and navigation projects led to the creation of vast river reservoirs. The resulting increase of water levels of major rivers led to the submerging of hundreds of villages. In the case of Usolye, the part of town nearest to the river was flooded with the formation of the Kama Reservoir in the 1950s. Although some of the most important monuments, such as the Transfiguration Cathedral, escaped outright destruction, others suffer from severe foundation damage at the water’s edge. A further blow was the abandonment of the historic center as a residential district. Fortunately, the dedicated efforts of museum personnel and the support of the regional administration have succeeded in preserving much of the core of historic Usolye. In addition to the Transfiguration Cathedral, which is now reopened for worship, the neoclassical Church of the Trinity (1813-20) is being restored. This is particularly gratifying, since the design of this church is attributed to Andrei Voronikhin, one of Russia’s greatest architects and a native son of Usolye. Construction of the church was undertaken by Baron Grigory Stroganov to honor the Stroganov family’s service to the Russian cause during the 1812 Napoleonic invasion. Perhaps the greatest achievement in historic Usolye is the preservation of the Stroganov Chambers, built in 1724 as the primary Stroganov residence in the Urals. Despite the date of its construction, the structure shows little western influence and bears a close resemblance to Moscow “chambers” of the late 17th century – before the architectural changes introduced by Peter the Great. This splendidly restored Stroganov residence now serves as a museum for traveling exhibits, as well as a center for cultural festivals along the Kama River. The Usolye district also contains a number of other historic sites, such as Pyskor (some 20 km to the north), whose hilly terrain offers some of the most picturesque vistas along the Kama. At the top of Monastery Hill is the charming Church of St. Nicholas on the Hill, built in 1695 and now being restored. To the south of Usolye is the village of Oryol, site of the Church of the Praise of the Virgin (1735). The sparsely decorated whitewashed walls of the exterior conceal one of the more colorful interiors of Russian provincial church architecture, with an unusual enclosed chapel in the center of the main church, as well as a soaring icon screen from an earlier, wooden church. Although Oryol is easily accessible by road, the more picturesque route is by boat from Usolye.